Crown Shorts is our basic shorts, made in a cotton/tencel fabric with high comfort. Pocket bags are made in a herringbone fabric. The shorts are stitched first and then dyed to obtain a unique colour effect. What if the colour is wrong and / or the size is not the right one? You have 14 days to regret your purchase from the day it arrived or reported to arrive. Return the product to us in the same condition and quantity (with hangtags etc. ), use the return form and we will return the money to you. If the item was damaged on delivery, or if you have received an incorrect item, please fill out the return form with the correct return code and send us the item within 14 days of arrival in the same condition and quantity (with hangtags etc.). As soon as we receive your return, we will refund the amount. You also have the option to cancel the order by refusing to receive the goods. If you do this, the item is returned to NN07.com. Customers outside Denmark and Sweden are to bear the return costs incurred when returning an item(s). All parcels remain the responsibility of the buyer until it is received at our returns address stated below. You are only liable for any diminished value of the items caused by handling other than what is necessary to establish the style, characteristics and the way it works. In other words - you can try it in the same way you would in a physical store. If the product is tested beyond what is described above, we consider it as used, which means that by the withdrawal of the purchase, you only get part or no amount at all in return, depending on the product's commercial value. To receive the entire amount you are therefore free to do the same as you do in a physical store. You can test the product, but do not take it in actual use. A) Waist (½) - The length from the fork (where the legs meet at the crotch) to the top edge, measured along the fly. B) Thigh Width (½) - The length from the fork (where the legs meet at the crotch) to the shorts hem, measured along the inside seam. 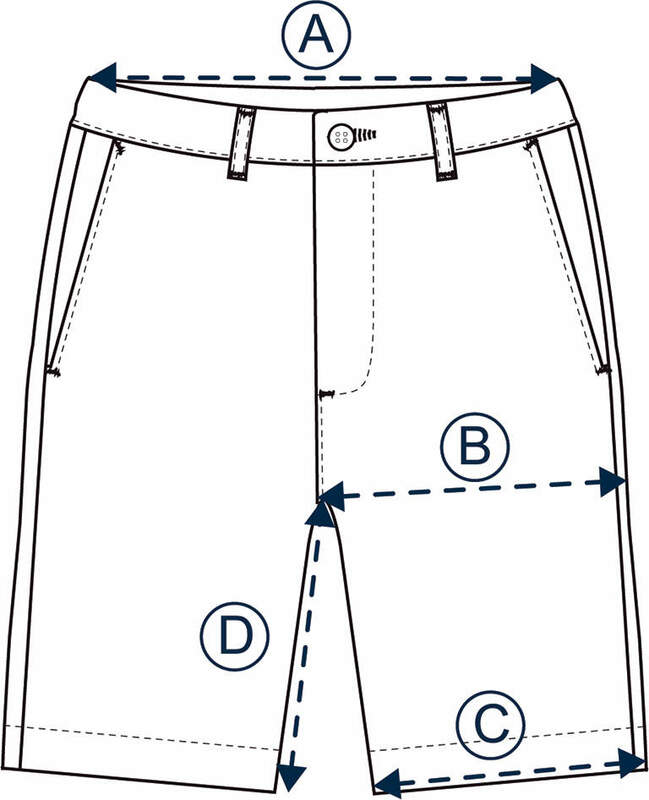 C) Leg Opening (½) - Lay the shorts leg flat and double the measurement of the hem. Flatten pleated or creased shorts along their natural crease. D) Inside Leg - The length from the top of the waistband to the shorts hem measured along the outside seam. We're sorry this item is currently out of stock. But please sign up and get news when its back. Please login below to access your order history. If you are a new customer please sign up first. pre-sale offers and other exclusive news. collections, pre-sale offers and other exclusive news.